Plot: Oliver’s father was gay. Despite this, he stayed married to Oliver’s mother for 44 years. In the aftermath of his father’s death, Oliver is left to ponder what his father meant to him. As he deals with this he meets Anna, and the two begin to fall in love. The poster of Beginners is unprepossessing. Three characters (and a dog) standing against a white background, simply looking at the camera has “self-indulgent American indie film” written all over it, much like The Savages, of a few years ago – a film which very few people will remember, I am guessing (and rightly so). These films are always deeply personal, but often dull, self-absorbed and involving characters you wouldn’t want to spend five minutes with, let alone two hours. 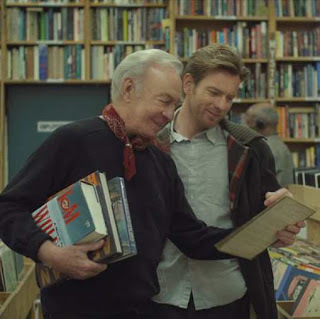 Fortunately, the end product of Beginners is infinitely better than the poster. Whilst it has its failings, it is much more towards the The Kids Are All Right end of the scale of Indie cinema – clever, witty and respectful. This is mainly because the three central performances (and the dog) are hugely engaging. Ewan McGregor is likeable and subtle as Oliver, whilst Mélanie Laurent is delightful as his love interest, Anna. Meanwhile, Christopher Plummer continues a string of charming performances as the belatedly-out father, Hal. Together, they give the film some almost tangible emotion, and make it very watchable. Beyond the performances, the film has a quirky, idiosyncratic style. Writer-director Mike Mills edits the film non-sequentially, which is at times a little distancing, as the parts of the story are given very little time to breathe, before we cut to something else. However, there are also little “slideshow” moments, narrated by McGregor, which amuse far more than they irritate. He also has the benefit of lots of good music, which he uses subtly and reservedly. This is, clearly, a personal production for Mills, but it never feels whiney; quite the opposite, in fact. Though this is not terribly profound, it is a very engrossing and unsentimental look at the worth of relationships, of many different kinds, and a statement of the importance of living for who you are and what you want. It also makes the very clear point that homosexuality is an issue which is still present and still carries a lot of hurt for many people. Such a point is sometimes lost in a time when, thankfully, being gay isn’t anywhere near as much of an issue as it was. Charm is in the eye of the beholder, and not all will agree, but none of this is preachy and the production as a whole is one with its heart in the right place, and it delivers a film of delicate emotion and simple, sweet entertainment.